James Valcq performing as Erik Satie in the Third Avenue Playhouse production of “Velvet Gentleman” at TAP in Sturgeon Bay. Photo by Len Villano. The one-man play Velvet Gentleman returns to Third Avenue Playhouse (TAP) for the holiday season. The work is a colorful journey into the mind and music of the witty and eccentric composer Erik Satie, whose music ranges from comically bizarre to hauntingly beautiful. Velvet Gentleman premiered at TAP in the spring of 2017. 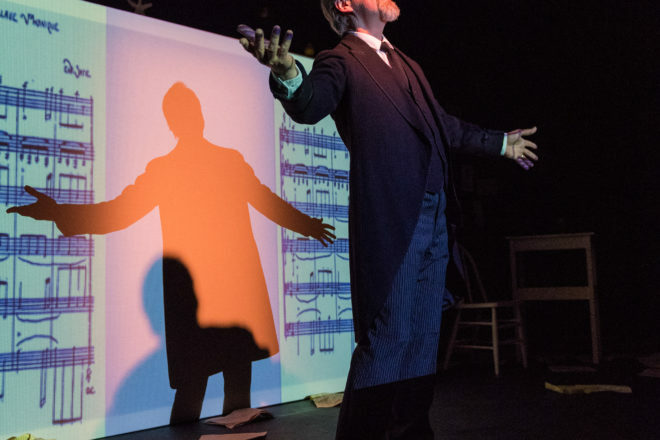 Created and performed by TAP’s Co-artistic Director James Valcq, this multimedia theater piece featuring Satie’s music, words and drawings will transport audiences to fin-de-siècle Paris. Valcq was recognized in the December issue of American Theatre in its monthly People to Watch column, with the writer referencing Valcq’s work as a composer. If you’re a fan of Valcq’s Velvet Gentleman, anticipate this: he is bringing another work out of obscurity and onto the stage July 25-Sept. 1, 2019, with his reconstruction of George Gershwin’s first Broadway musical, La-La-Lucille! It was Gershwin’s first Broadway musical to feature only his work. Velvet Gentleman will be on stage Dec. 19-30, Wednesday to Saturday, at 7:30 pm; and Sunday at 2 pm. A special Dec. 31 performance will be held at 7:30 pm. For more information and to purchase tickets, visit thirdavenueplayhouse.com.